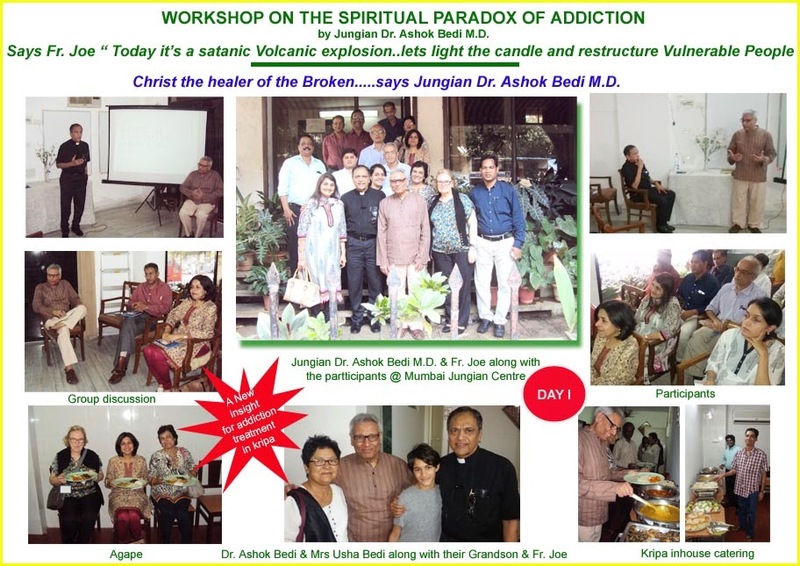 Mumbai Jungian center and Kripa Foundation is conducting a two day workshop on “The Spiritual Paradox of Addiction by renowned Jungian Dr. Ashok Bedi M.D. from Milwaukee US. The workshop is being held at Dr. Leo Barnes Foundation, Bandra Mumbai. The workshop commenced with a Prayer and Meditation service by Fr. Joe, who later introduced Dr. Ashok Bedi to the participants. Fr. Joe further mentioned that it was the Grace of God to have Dr. Bedi train the staff of Kripa as his new teachings will help Kripa face the challenges that are today rising at an alarming rate in the treatment of addiction. The day long workshop conducted by Dr. Ashok Bedi included topics on Spiritual Paradox of Addiction, Faith Cultivation and case study. It was indeed an enriching experience as Dr. Ashok Bedi and Fr. Joe conducted the session with a lot of interactions and group participation. After lunch Fr. Joe conducted a superb light meditation with the participants to pep them up for the afternoon session of Dr. Bedi.